What has webbed feet, waterproof feathers, a broad bill… and nests in a tree? Don’t let that last clue fool you. While it’s true most ducks build their nests on the ground, the wood duck (Aix sponsa) aims a little higher. This species is easy to recognize, at least as adults. The male is a dandy dabbler, sporting a glossy iridescent green head, a white chin, and a speckled russet cravat. The female’s wardrobe is a bit more subdued, but her large, white teardrop-shaped eye patches are unique among North American ducks. Wood duck hens prefer to nest in a tree cavity, but they’ll accept a custom-made nesting box if it’s positioned correctly—you know what the Realtors say, “Location, location, location.” After hatching, ducklings spend about 24 hours in the nest while their baby down dries. The young are precocial, meaning they can walk, swim, and feed on their own—but first they have to get out of the tree house. And that first step is an 8–30’ doozy! Momma flies down to the ground and then calls for her offspring to follow. But the hen has fully developed, fully feathered wings. There’s nothing aerodynamic about a one-day old duckling. Yet, one by one, they use their sharp claws to scramble up from the nest floor to the entrance, balance on the edge, and…. LEAP! Fluttering useless wing stubs they fall like fluffy stones and land with a thump on their sternums. They shake it off and wait for the rest of their siblings to take the plunge, then the whole family heads off to join Dad at the nearest body of water. Foolhardy as this approach to child-rearing may seem to us, it’s worked very well for generations of tree-nesting ducks. That is, until they had to share the woods with people. Mother duck may mistake a swimming pool for a pond, and while she can easily clear a tall fence to find wilder waters, her youngsters can’t. However, they’re drawn instinctively to the safety of water. Homeowners who find themselves hosting an impromptu waterfowl pool party should consult with their friendly neighborhood wildlife rehabilitator for advice. 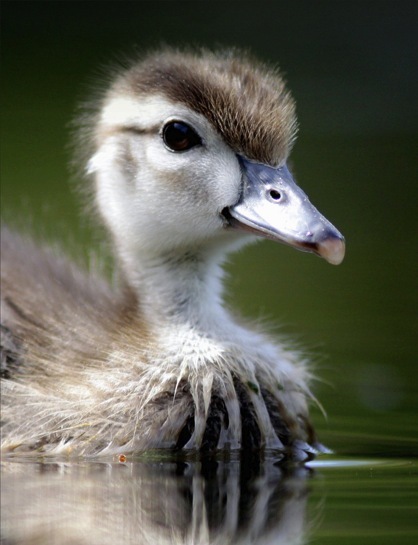 Wood ducklings are shy creatures, and the wrong kind of help can send them into a state of shock, or worse. Delicate? I guess that’s one way to look at it. Who am I to judge, though? I’m not afraid of heights, but if I were a duckling making that jump from nest to terra firma, I’d be in shock before I was halfway down. © 2011 Next-Door Nature— no reprints without written permission from the author. 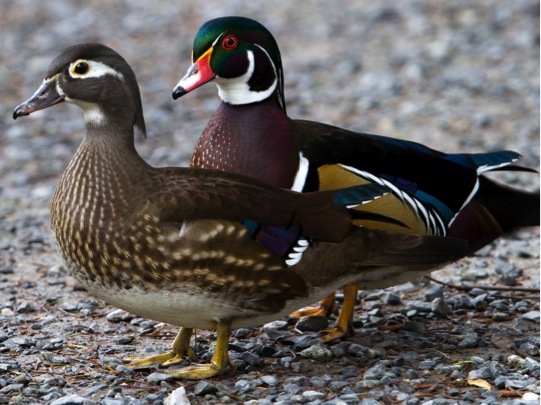 Thanks to Rick Leche for using the Creative Commons license for his beautiful photograph of the wood duck drake and hen. This entry was posted in behavior, birds, natural history, nesting behavior, wildlife rehabilitation, wood duck and tagged animal behavior, breeding, duck, duckling, hidden nature, hidden wildlife, Nature, nesting behavior, postaweek2011, suburban wildlife, urban wildlife, watchable wildlife, wildlife, wood duck, wood duckling by Kieran Lindsey. Bookmark the permalink. What a precious video. Thank you for sharing this. Made my day. I’m going to post the link to this on my blog as I know the folks who read my posts would enjoy this as much as I did. awww, I watched a mom and dad duck during the pregnancy stage and then they were born! Then the mom had to force the six babies to jump off the roof where they were born to a local pond. Great photos. I was shocked to see the ducklings tumbling out of the nest from up in the tree, but they seemed to take it in their stride! All part of nature I suppose. Incredible video, thank you so much for sharing it here. How does the great big mother wood duck get into the box? Fun video! It’s almost as difficult to grok how ducklings can survive the tumble as the fact that the momma duck can fit inside that birdhouse. Is there secret side door just out of view or is this duck magic? Cheers!